£1,500 through the sponsored cycle. The friends, all football fans, gave the challenge a sporting theme by starting at the Etihad Stadium, the home of Manchester City Football Club, and finishing at their beloved West Bromwich Albion ground. 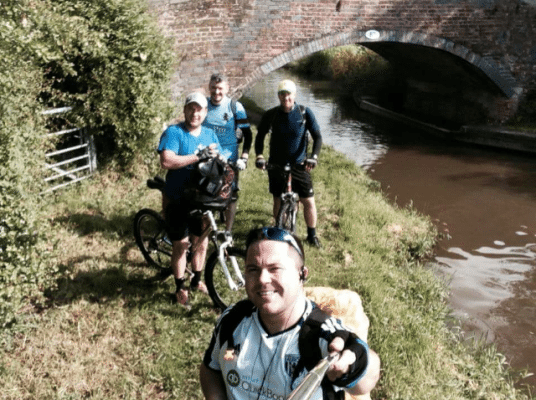 Gareth and his fellow fundraisers travelled the scenic route, choosing to pedal as many miles as possible on canal tow paths. As the journey progressed, the team suffered aches and pains, had to repair punctured tyres and washed their wheels in the canal. Visit Gareth’s JustGiving page to donate http://www.justgiving.com/gazz-long1 or text GAZZ82 £5 to 70070.